Ward six residents may have a new waste and recycling collection schedule effective January 1st 2018. Click on this link http://www.newmarket.ca/collectionchange or on the image and enter your full address... 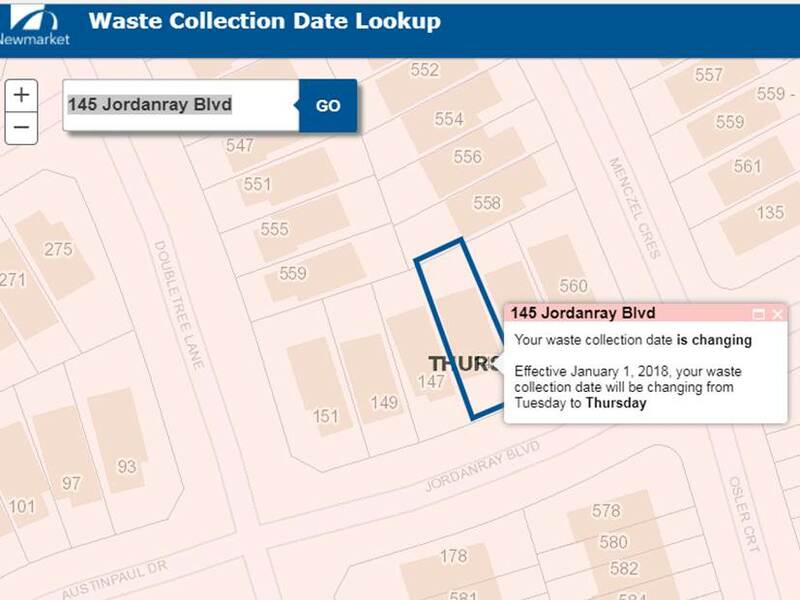 The Town of Newmarket's NEW waste collection map will pin point your home and tell you your new collection day. for example my collection day for my home 145 Jordanray Blvd. is changing from Tuesday to Thursday. The new waste and recycling collection schedule change comes with the new waste and recycling contract that was awarded to Green For Life (GFL) through a request for proposal (RFP). This RFP was made in partnership with the northern six municipalities of East Gwillimbury, Township of King, Town of Aurora, Town of Georgina, Town of Whitchurch-Stouffville and the Town of Newmarket. This contract will be in effect from January 1, 2018 to December 31, 2025. Expanded Customer Service Centre located in Aurora to better serve the community with their waste and recycling matters. New energy efficient waste and recycling vehicles, which will lead to a decrease in greenhouse gas emissions. New GFL trucks equipped with GPS tracking technology. Contract savings by partnering with the northern six municipalities as opposed to an individual bid for waste and recycling pick-up. New blue bin and green bin delivery replacement program by GFL. Residents who want to exchange their damaged blue or green bin can contact GFL at 1-866-421-5625. A GFL representative will exchange the damaged bin free of charge. Residents can still visit a Town of Newmarket facility to exchange or purchase a new blue or green bin.